Abdominal compartment syndrome is associated with severe dysfunction of intra-abdominal and intrathoracic organs. Medical therapy, with the goal of reducing intra-abdominal pressure, leads to improvement in organ perfusion. A 67-year-old female underwent surgical repair for acute Stanford Type A dissection. 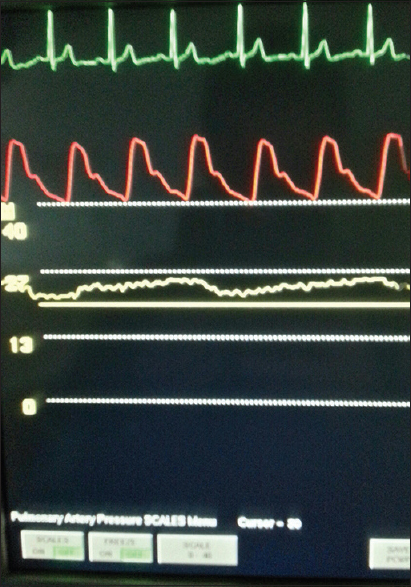 Ascending aorta was replaced with a tube graft (Cardiopulmonary Bypass Time 233 min, Aortic Cross Clamp Time 119 min). During the 3rd postoperative day, the patient developed an acute kidney injury, as well as elevated liver transaminase, was noted. Intra-abdominal pressure (IAP) measured through urinary bladder catheter was found to be 20–23 mmHg [Figure 1]. In 2006, World Society of the Abdominal Compartment Syndrome defined this syndrome as a condition where IAP is more than 20 mmHg (with or without abdominal perfusion pressure <60 mmHg) and is accompanied by organ dysfunction. Postoperative abdominal compartment syndrome is not unusual and can be caused due to capillary leak, ischemia-reperfusion injury, and massive fluid resuscitation., To exclude mesenteric ischemia and visceral malperfusion syndrome, abdominal computed tomography angiography (CTA) was performed. The CTA revealed a dissected descending abdominal aorta extending to the right common iliac artery. The celiac trunk, the superior mesenteric, and the right renal artery arose from the true lumen. The inferior mesenteric and left renal arose from the false lumen. A severe narrowing of the origin of the celiac trunk [[Figure 2]-red arrow] was observed, and the true lumen was markedly compressed by the false lumen [[Figure 2]-black arrow]. Taking this information into account, we deduced that the vessels although stenotic were patent and that an increase in IAP may further reduce arterial flow to the abdomen. We decided to pursue conservative management comprising of early initiation of renal replacement therapy, negative fluid balance, sedation, paralysis, GI tract decompression (nasogastric and rectal tubes, enemas, and neostigmine for bowel distension), and maintenance of higher abdominal perfusion pressure. The patient got progressively better and made a complete recovery. Loftus IM, Thompson MM. The abdominal compartment syndrome following aortic surgery. Eur J Vasc Endovasc Surg 2003;25:97-109. 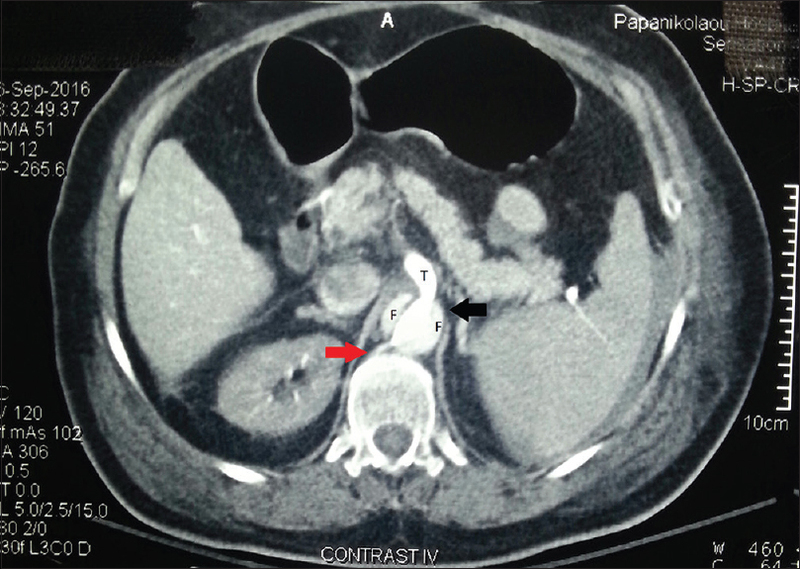 Djavani Gidlund K, Wanhainen A, Björck M. Intra-abdominal hypertension and abdominal compartment syndrome after endovascular repair of ruptured abdominal aortic aneurysm. Eur J Vasc Endovasc Surg 2011;41:742-7.